This series, I HAVE TO DECLARE: I stuck with it to write a review, and so I will write a shortcut way to watch this show at the bottom of this review. Some episodes in the middle were a bit unnecessary. Hmm the story eh? Ep 1- 2 were sort of intros, 3-7 were more of character-based, and ep8-12 were with a plot. The storytelling method is really really dull at times. I especially only appreciated about 30% of the content in eps 3-7 on average. The producer sorts of using a beat around the bush and slow form of presenting the story. I skipped soem parts of ep7 as a result. The story plot is incredible. In the first few episodes we see a few Unidentified Characters (UC) around in some of the scenes. Argh if they were flying they would be UFOs D:. Character introduction is weak in some episodes, bringing confusion to what role they actually play in the series. The story plot is really developed from episodes 8-12, especially 10, where some of the characters' past were explored. But isn't it too late? By that time many ppl would have dropped the series already...==. And ... the plot was sort of caused by a misunderstanding, and could have easily resolved by some explanation/ education of a few notable characters. Preventing should have been easy as well. And till now I still dunno how the misunderstanding about Haruhi haven't stolen something precious to Ibuki came about. It was not properly explained. One very big letdown of this series is that there is no real climax at all. The ending parts were lacking in action, and the music did not help the atmosphere as well. It just felt as if it was another complication. O yea, and the ending parts were kinda confusing, I especially did not get what happened to Saya's dad in the end, he simply disappeared. Story incoherence there. The colours were sort of dull. Some special effects, like some magic, were of a higher standard than the usual standard displayed. Colour was dull for some magic effects too, so some magic didn't really seem like magic. At times Jun's hair was shining when it wasn't supposed to. OP and ED was ok. BGMs used were ok, but did not fully display the supposed emotions that were on screen. Special effects sounds were unimpressionable. Voice acting is good though, although Jun's voice was duh, a girl's, so I couldn't think of him as a girl. Character introduction was very weak in the front and back of this series. In the back a lot of characters came out but were barely explained. I could not understand some of their actions. Now, about the character cast, I dunno what to say about Yuuma. About his hatred of magic, actually by the end I could think of a much better way to cure his magic-related probs rather than making him hate magic. [Trying to not include spoilers] Well, maybe they made the wrong choice then. The other main characters were not really developed as well. Some development was made on a few, but often only non-consequential development. But one problem is that the group of friends in the series are over-friendly with themselves, so the lack of conflict was rather dull as well. (I'm not including Ibuki and the other 2). Bad presentation. Severely dull. Ok-ok ending. The comedy in this series were a bit not very funny. Usually I enjoy magic genre shows but... there was not a lot of exciting displays of it, like the clashing of magicians. I did not read the manga, so I'm not sure if this is the original storyline, but this series is not very interesting. Watch if you think you need to slow down :p.
O yea, in some episodes the timing of the voices and subs were off, I watch eng subbed eps. Ibuki is Sumomo's classmate and only friend in school. Saya and her brother are Ibuki's "servants". The group of friends want to putt Ibuki into e group. The one with the green Tama-chan is the Divination club president. I really liked the whole idea that there is a school that is seperated into two devisions, magic and non magical. A lot of mysterieous events happen that are unexpected and there are twists and turns. While some things are quite obvious what the awnsers are, there are things that are less so. The artwork is extremely detailed, expessully the costumes of the magic users. This detail helps to give each character their personality. There were way too many explouding noises and odd noises that weren't so much needed. There was also nothing that stood out to me. The cast has a wide range of characters, from a crossdressing boy who wishes he was a girl, to a boy who hates, to a girl who is looking for the boy who saved her as a child using magic. I enjoyed every minute of it and loved the characters very much. Everything for me was very good. There are plenty of series where I've been unimpressed by the first few episodes, but grown to enjoy or totally love the result. It can be all about the writers hitting their stride, learning the characters, finding the new twists on old ideas that will surprise you, and somewhere in the middle there'll be a beach trip. This is not one of those series. This is the complete opposite. The writers actually started with a decent enough twist on the "magic high school" trope, and the first few episodes are "good enough" to make you want to see where it goes. IT GOES NOWHERE! Instead, the writing spirals downward after about the third episode. The characters are completely two-dimensional (no pun intended). They're stupid to the point of absurdity, and it's only their stupidity moving the plot forward. That's the kind of cheap writing that you can get away with a few times in a series, but you can't build the entire thing on it. This isn't Hamtaro, for crying out loud, it's trying to be a "serious anime." I lost all suspension of disbelief somewhere around the time where we find out why the main character was adopted (something like episode 8). It was crap before that, and it's unwatchable after. Oh, and there's the antagonist who doesn't care about killing her allies until she accidentally injures one. I pretty much fast-forwarded the last three episodes just to find out the ending, which was predictably stupid. I really don't like spoilers, so I'm trying to be vague about the plot points and describe the series in terms that will help you recognize what you're getting into. All-in-all, this series was barely worth having on as filler while you're doing something else. Since no criticisms of this show are going to be very interesting or entertaining, let’s start with some storytime. I first saw Happiness back when I was still finding out the whole identity of the anime medium, and that intrigue carried the show for me. I immediately saw it as weak, but a few more shows would enlighten me as to just how weak it was. Soon I recognized it as the worst show I’d completed, and many years later it remains at the bottom of the barrel. Happiness is about an teenager with supernatural powers named Haruhi (not that one) who goes to a magic school after being inspired by a boy wizard in her childhood. She is generally likable but boring as a blank wall and consequently forgettable. 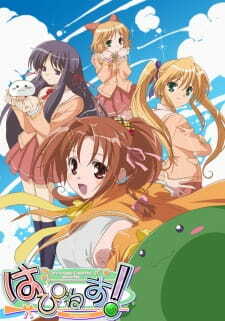 Her wacky friends don’t amount to anything beyond the bare basics of anime character stereotypes, being the equally bland love interest boy, his horny sidekick, pigtailed incompetant tsundere with an attitude, and the character designed as a girl but written as a boy for no reason except to be their only defining trait. If this band of cardboard cutouts is our main cast, imagine how memorable the side characters must be. The art design in Happiness is exceptionally horrible. The character design and animation is just unmentionable, the rainbow of excessive, jagged hairstyles has never looked tackier, and the magic effects couldn’t compete with cheap anime from the 90’s. It’s easy to call it a passionless hackneyed snoozefest, and the constant corner-cutting only proves how much of a filler show this was for the studio. Which was Artland by the way. The one that had just made Mushi-shi. I rest my case. The whole thing is childish and pretty much only meant for soon-to-be-teens, and though that just makes it more difficult to find a western audience, it doesn’t excuse an initial lack of effort on all levels. A solid ending to a plotline involving characters that we have no interest in whatsoever doesn’t earn much praise, and an OVA with transgender invalidation overtones isn’t going to help it out either. The biggest issue is that every single element in this show is done better in some other anime. It was just a small show to fill a season for the studio without having to worry about quality control, and it’s an easy skip for us all today.